The Dodge Challenger SRT Demon will have a unique data recorder so you can show your receipts for your sick quarter mile runs. It will also be the perfect tool for the insurance company to know how you trashed an overpowered muscle car exclusively designed for straight line speed. Also, gizmos! There also seems to be an easter egg revealed within the power chart that maxes out at 800 and the clock that is set to 7:57 indicating that the Demon may indeed make only 757 horsepower. In this week’s installment of the neverending Dodge Demon tease, the automaker revealed a new “performance pages” application integrated into the car’s Uconnect infotainment system. Do you like graphic displays? Because this puppy has graphic displays out the wazoo, including ones for power, torque, G-forces, even tell you how much power you gain from the application of Direct Connection Performance Parts. In addition to some really cool graphs, you will even be able to adjust the line-lock, the launch RPMs, and program the shift lights. Also included in the Performance Pages are timers for reaction time; 0-60 mph, 0-100 mph, eighth-mile and quarter-mile elapsed time and vehicle speed. 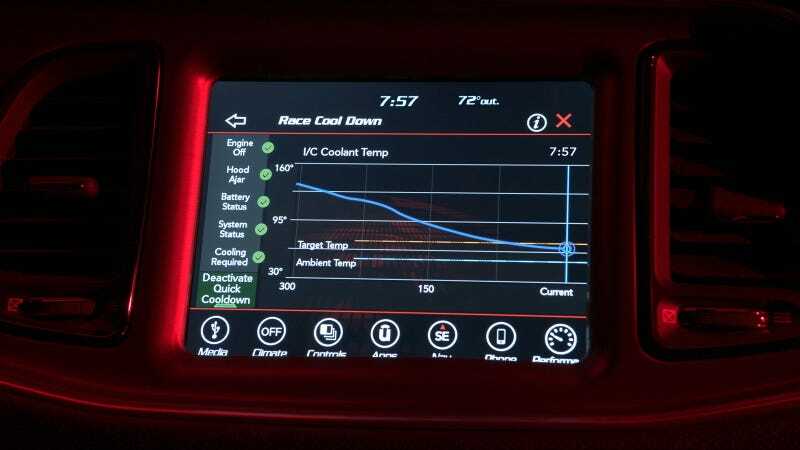 Dodge says the new data recorder feature will allow drivers to optimize the car for track and weather conditions, as well as improving driving techniques. Of course, if you’re driving techniques aren’t quite up to par with the performance of the Demon, your reaction time or lack thereof, will be on full display as evidence for law enforcement and insurance companies. So it will probably take you like 30 minutes to figure out your driving mode before laying wicked burnouts. And once you are done laying down some rubber the Demon is the first-ever factory production car to have an After-Run Chiller, which keeps the cooling fan and intercooler pump running after engine shutdown until a targeted temperature is reached. The Demon is going to be so hot, yet so chill.